Since its origin in the middle of the 20th century, the National School Lunch Program (NSLP) has provided a direct policy link between agriculture and child nutrition through its allocation of commodity foods as in-kind benefits to schools. When nutrient deficiency was the primary concern for children’s health, the school commodity program provided a convenient policy solution for lawmakers, for it simultaneously supported agricultural producers through consolidated purchases and assisted schools to provide meals to students. While the broad objectives of federal agriculture policy—to support market growth and stable prices—have remained relatively constant over the past half century, the objectives for children’s health policy have been significantly redirected because of new concerns about nutrition and obesity. School operational capabilities have also changed substantially since the NSLP’s first years. Despite these changes, little research has been conducted to examine whether the link between agriculture and health within the school commodity program continues to offer benefits for its intended beneficiaries. This article reviews the school commodity program’s original policy objectives in light of current information about the program’s impact on schools, child nutrition, and the agricultural sector. The school commodity program began as an agriculture initiative to provide an outlet for excess production by American farmers. In the debates leading up to the 1946 passage of the National School Lunch Act, policymakers from the Agriculture Committee in the House of Representatives expressed hope that a federally funded lunch program would create new and lasting demand for American agriculture. This concept is known as additionality, which in this case means the amount by which a dollar of government program spending results in additional food consumption. Lawmakers assumed that donations of surplus foods would also provide a financial and nutritional benefit to schools and students. In 1973 the United States Department of Agriculture (USDA) informed Congress that it could not continue to guarantee sufficient levels of school commodities because market conditions—which had changed substantially from the time of the first federal commodity donations to schools during the Depression era—dictated the department’s annual commodity acquisitions (United States Congress, 1994a). As a result, in 1974 Congress amended the National School Lunch Act to require the USDA to use NSLP funds to purchase commodities to “maintain the annual programmed level of assistance for schools” (United States Congress, 1994a). This legislation marked a permanent shift in the philosophy of school commodity foods. The USDA had previously channelled foods to schools from its existing stocks that accumulated as a result of surplus removal programs; now the USDA was instructed by Congress to purchase products on behalf of schools to maintain an annual level of commodity assistance. In 1994, the role of “entitlement” commodities in the NSLP was enhanced when Congress amended the National School Lunch Act to require that no less than 12% of total assistance for the NSLP be dispensed to state agencies as commodity foods (Richard B. Russell National School Lunch Act). The school commodity program’s current success in terms of supporting the agriculture sector is best evaluated through evidence that the program has created the additionality—meaning consumption in excess of that which would occur without the program—that policymakers originally expected. Ironically, however, any evidence of additionality due to the school commodity program may also be interpreted as a policy failure with respect to the nutrition goals of the school lunch program, now that overconsumption of calories is a primary challenge to children’s health. In terms of child nutrition, the most desirable evidence of the commodity program’s policy success would be findings that show that the program improves school meal nutrition or compliance with USDA nutrition standards. The most desirable evidence of the commodity program’s success in terms of school finance would be that which proves that schools can obtain foods more cheaply through the USDA than through commercial vendors. The most recent study to assess additionality for agriculture due to the NSLP is based on data from the early 1980s. After controlling for factors affecting NSLP participation, demographic factors, household factors, and geographic factors, it was reported that for each dollar of federal NSLP benefits—both cash and commodities—received, households reduced their spending by only 61%, or $0.61, rather than a full dollar (Long, 1991). One way to interpret this result is that the NSLP reduces household food expenditures. Another way to interpret this result is that NSLP benefits do not fully replace household food expenditures; thus, the total effect of each federal dollar spent on NSLP reimbursable meals is an estimated $1.39 for the agricultural sector. The per-lunch federal cash reimbursement rates for school year (SY) 2009-10 for free, reduced-price, and full-price lunches are $2.68, $2.28, and 25 cents, respectively, while the commodity benefit provides an additional 0.195 cents per meal served, regardless of student payment (USDA Food and Nutrition Service, 2009). Based on 39 cents additionality for every dollar of federal NSLP benefits received by households, it may be inferred that the school commodity program estimated additionality for the agricultural sector due to the school commodity program is 8 cents for each lunch served in schools. However, there are significant drawbacks to applying this estimate to assess the additionality of the school commodity program. First, this estimate is nearly 30 years old. Second, this estimate includes only the federal per meal reimbursement, which represents just part of the full cost of the commodity program at the federal, state, and local levels. Thus while it is accurate to say that every $1 in school commodity benefits received by households results in additionality according to this estimate, it is inaccurate to say that $1 in public spending on the commodity program results in additionality. Finally, the use of household food expenditures to estimate additionality due to the commodity program, specifically, is a convoluted means of measurement. The more accurate way to determine whether the school commodity program creates additionality for the agricultural sector would be to assess school food expenditures among schools that have “cash in lieu of commodities” or commodity letters of credit (CLOC)—which enable school districts to conduct local procurement of foods specified by the USDA—compared to food expenditures among schools that receive commodities. Kansas is the only state with 100% cash in lieu of commodities, though a few other school districts across the country have cash in lieu or CLOC programs that remain from a 1980s pilot study of alternatives to the commodity program. No comparative research has evaluated school food expenditures among commodity schools compared to cash in lieu or CLOC schools; thus, no direct estimates exist of additionality due to the school commodity program. It is clear, however, that the combined value of all federal commodity purchase programs—including the school commodity program—are marginal with respect to total annual farm receipts. In 2007, national farm receipts exceeded $284 billion, while the reported value of commodities delivered to all federal programs was just $1.3 billion, or 0.5% of farm receipts (USDA Economic Research Service, 2009; USDA Commodity Food Network, 2009). 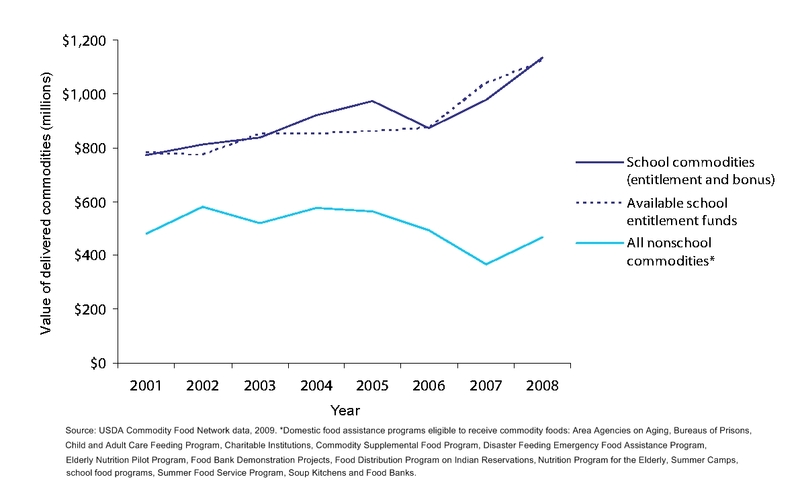 Schools receive the majority of government commodities purchased for food assistance programs, as demonstrated in Figure 1. USDA data indicate that the school commodity program received 70% of the total value of commodity foods delivered to all federal food assistance programs in 2008 (the data range for 2001 to 2008 is 58% to 72%) (USDA Commodity Food Network, 2009). As also demonstrated in Figure 1, for several years from 2001 to 2008 schools did not receive the full value of commodities that was allocated, even if the value of bonus commodities was included. Each year that this occurred represents a loss to both the agricultural sector and schools. Just one recent study—detailed below—has assessed the factors that contribute to schools’ failure to obtain the full value of allotted commodities funding. Commodity foods constitute approximately 15% of foods in school meals, while the remainder are purchased commercially (USDA Food and Nutrition Service, 2008). The USDA list of available commodity foods in SY 2008-9 contained over 180 items. State agencies and school officials are responsible for selecting and ordering commodities from the USDA. It is unlikely that a direct connection between consumption of school commodities and children’s health could be found. For example, there is no evidence in the published literature that commodity cheese or canned pears have unique nutritional attributes compared to their commercial equivalents. In some cases, schools may be able to specify nutritional attributes—such as “low sodium” or “zero transfat”—for end products made with commodity foods that have been ordered from the USDA and diverted to commercial manufacturers for further processing. Schools may order bulk commodity food products from the USDA and divert them to commercial food manufacturers for conversion to end products; for example, bulk chicken could be converted to chicken nuggets (USDA Food and Nutrition Service, 2007a). However, this does not necessarily mean that products with similar specifications are not available through local commercial markets. In the School Nutrition Dietary Assessment Study III, researchers mention that some prepared foods—including pizza, chicken patties, French Fries, and breakfast sandwiches—are manufactured exclusively for school food services (USDA Food and Nutrition Service, 2007b). However, researchers do not provide insight into whether these school-only foods have nutritional attributes that are superior or inferior to commercial formulations or identify whether commodity foods are used in the preparation of such school-only foods. The Food Research and Action Center recently concluded that the commodity program likely provides significant political support at the national level for the NSLP, though decision-makers at the national and state levels could do more to improve the quality and nutrition content of commodity foods that are offered to schools (Food Research and Action Center, 2008). Further, researchers noted that the commodity program leaves little room for wider fresh fruit and vegetable offerings because the program’s ordering, purchasing, storage, and transportation methods tend to require shelf-stable products, rather than perishable items. Despite the commodity program’s proclivity for shelf-stable products, the Department of Defense operates a “DOD Fresh” program to provide fruits and vegetables to schools in most states. An evaluation by the USDA’s Economic Research Service in 2003 reported that children consumed 92% to 93% of servings offered during a brief pilot program in 2002, and that 71% of the school administrators believed that students’ interest in fresh fruits and vegetables served at school had increased during the pilot period (Buzby, Gutherie, and Kantor, 2003). However, the value of DOD Fresh commodities accounted for just 4% to 6% of the total school commodity value at the national level from 2006 to 2008 (USDA Commodity Food Network, 2009). There is also limited evidence that some districts may be able to purchase fruits and vegetables more cheaply in their local commercial markets (Hecht, et al., 2008). A report published by the Robert Wood Johnson Foundation assessed commodity orders among California schools in SY 2005-6 and reported that over 82% of the state’s school entitlement value was directed toward meat and cheese products (Hecht, et al., 2008). Though researchers pointed out that these products are high in fat and saturated fat, this information offers little evidence that could be used to assess whether the commodity program has an impact on child nutrition or adherence to USDA nutrition standards. School meals are required to have minimum calorie content, and thus it is reasonable that some food items in school lunches will have higher calorie and fat content. Also, it would be rational for schools to allocate their commodity funds toward products with the greatest price advantage over equivalent commercial products, and it may be that meat and cheese items offered the best price advantage that year to schools in California. Definitive conclusions about the commodity program’s impact on child nutrition could only be achieved from schools’ ordering information if it were proved that some aspect of the commodity program leads schools to order and serve more foods that have undesirable nutritional attributes than they would in the absence of the commodity program. Therefore, current evidence about the commodity program’s impact on school operations and finances would be a useful element in an assessment of the program’s impact on child nutrition. The USDA is responsible for providing a systematic review of the costs and benefits of providing commodities, according to the National School Lunch Act, though the most recent study with a direct comparison of commercial and USDA commodity food prices was published over 10 years ago. In 1998, the USDA published a report on the prices paid by one of its procurement arms, the Farm Service Agency (FSA), compared to prices of equivalent commercial products (MacDonald, Handy, and Plato, 1998). The report compared just six products and reported that USDA prices were 4% to 38% lower than equivalent commercial products. Recent research from Minnesota provides empirical evidence that this statement remains relevant. Based on order data from all Minnesota schools in SY 2008-9, it was estimated that for every $1 spent on USDA commodity products, schools pay on average an additional.12 cents to 27 cents to transport and store those products, compared to an additional 2 cents to 3 cents cents for commercial equivalents (Peterson, 2009). This research was restricted to regular packaged commodities and did not include commodities diverted for further processing. However, the products in the Minnesota analysis constituted over 60% of the collective commodity order value among schools in the state. The Minnesota research also compared commodity food prices for 48 products to prices for commercial equivalents to test the USDA’s claim that the commodity program offers lower unit prices to schools (USDA Food and Nutrition Service, 2008). 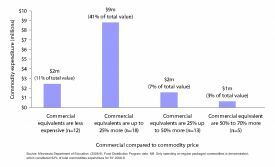 As demonstrated in Figure 2, 25% of the USDA commodities were more expensive than commercial equivalents that were locally available. Once full procurement costs—including product cost, handling, transportation, administrative labor, warehousing, inventory investment, and cost of risk to hold inventory—were included in the cost assessment, commercial products on average were estimated to be 9% less costly for schools than equivalent USDA commodity products. An analysis of Minnesota schools’ commodity spending highlights further concerns about the assumed financial benefits that the commodity program provides to schools. 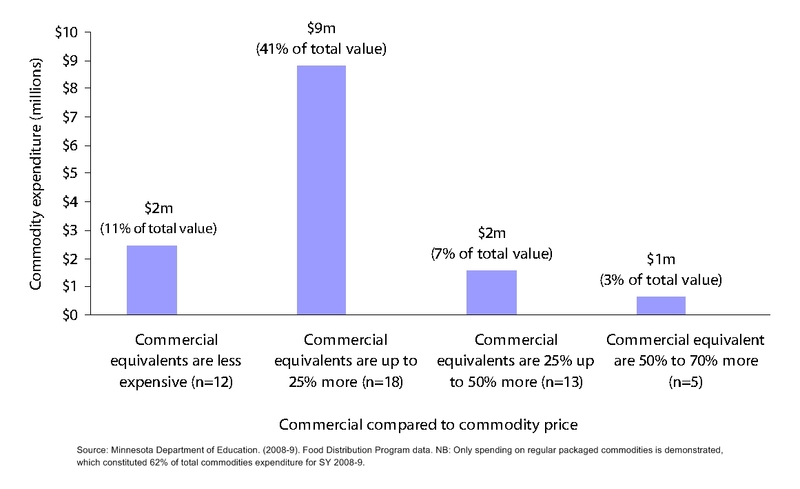 As also demonstrated in Figure 2, Minnesota schools directed just 3% of their collective entitlement funding toward commodity products with the greatest price advantage over commercial products, and 11% of their entitlement value toward commodity products for which commercial equivalents were less expensive. The Minnesota research did not offer an opportunity to closely examine the factors that motivate an individual school district’s ordering decisions. However, it was reported that prices paid for commodities were substantially different from prices schools had seen at the ordering stage. From SY 2005-6 to SY 2008-9, the average one-year price change across all food groups was an increase of 12%. It was also reported that school districts received the same quantity of regular packaged commodities as ordered for only 54% of orders, and 9% of commodity orders were delivered late to the state warehouse. Imperfect price information and an unreliable supply chain may contribute to schools’ apparently inefficient allocation of commodity resources. The modest level of evidence currently available about the commodity program’s impact on agriculture, children’s health, and school finances suggests that the school commodity program does not achieve substantial advantages for its intended beneficiaries. The DOD Fresh program appears to be well received by schools, though the program is limited in scope compared to the total school commodity program and there is currently no evidence that the program provides foods at a lower cost than commercial vendors. Cash in lieu and commodity letters of credit programs are understudied, despite statements from school officials in congressional testimony that such programs—particularly CLOC—would offer better benefits to schools than the current system of USDA purchases (United States Congress, 1994b). Targeted commodity products that offer a substantial price advantage to schools could be offered by the USDA if the department engaged in research to ascertain which commodities are consistently less expensive than commercial equivalents. An improved supply chain for school commodities has the potential to make the commodity program more beneficial for schools. However, this would likely involve increased costs at the federal level. Prices to food producers—a primary concern for the lawmakers that supported the original NSLP legislation—could be higher if schools were permitted to conduct 100% of their own procurement. As indicated by research from Minnesota, product prices for commodity foods are, on average, lower than prices for equivalent commercial products, though extra costs of transportation and storage due to an unreliable commodity supply chain mean that commodity foods were found to be ultimately more costly for schools. Permitting schools to make local decisions about all food purchases, therefore, may result in both higher prices to farmers and cost savings for schools. At this time, there is no evidence to suggest that USDA commodity foods are nutritionally distinct from commercial equivalents. The issue that should be used to judge the school commodity program’s success, therefore, is whether commodities provide a financial benefit to schools and food producers. Based on the limited research that is available, it appears that the school commodity program provides little, if any, benefit to agriculture, and may actually create greater costs for schools. Ultimately, school officials are likely in the best position to judge whether the commodity program provides a benefit to school meal programs. It is likely that some products or aspects of the commodity program are more desirable to some schools than others. Therefore, in the absence of evidence that the current system provides substantial benefits to agriculture, it may be reasonable to allow schools to choose either to continue with the existing commodity program or to opt for a more flexible option, such as commodity letters of credit or cash in lieu of commodities. Buzby, J., Gutherie, J., and Kantor, L. (2003). Evaluation of the USDA Fruit and Vegetable Pilot Program Report to Congress (No. EFAN-03-006). Washington, D.C.: United States Department of Agriculture. Food Research and Action Center. (2008). Commodity foods and the nutritional quality of the National School Lunch Program: Historical role, current options, and future potential. Washington, D.C.
Hecht, K., Sharp, M., Beller, D., Shimada, T., Samuels, S., and Boyle M., et al. (2008). The impact of the federal child nutrition commodity program on the nutritional quality of school meals in California. Princeton, NJ: Robert Wood Johnson Foundation. Long, S. (1991). 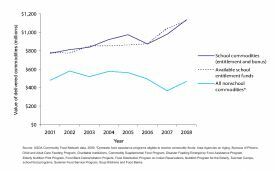 Do the school nutrition programs supplement household food expenditures? Journal of Human Resources, 26, 654-678. MacDonald, J., Handy, C., and Plato, G. (1998). Food procurement by the USDA's Farm Service Agency (Economic Report No. 766). [Washington D.C.:] United States Department of Agriculture, Economic Research Service. Minnesota Department of Education. (2008-9). Food Distribution Program data. Peterson, C. (2009). A comparative cost analysis of commodity foods from the U.S. Department of Agriculture in the National School Lunch Program. Journal of Policy Analysis and Management, 28(4), 626-654. Richard B. Russell National School Lunch Act (79 P.L. 396, 60 Stat. 230). (1946). United States Congress. (1966). Congressional committee hearings, House of Representatives, Committee on Agriculture: Washington, D.C.: United States Government Printing Office. United States Congress. (1994a). Child nutrition programs: Issues for the 103rd Congress. A report prepared for the Subcommittee on Elementary, Secondary, and Vocational Education of the Committee on Education and Labor, House of Representatives (Serial No. 103-H). Washington, D.C.: United States Government Printing Office. United States Congress. (1994b). Health Meals for Healthy Americans Act of 1994 (Commodity Letter of Credit-CLOC). Hearing on H.R. 8, before the Subcommittee on Department Operations and Nutrition of the Committee on Agriculture. House of Representatives, 103rd Congress, second session. Washington, D.C.: Government Printing Office. United States Department of Agriculture, Commodity Food Network. (2009). Commodity data. Washington D.C.: United States Department of Agriculture. United States Department of Agriculture, Economic Research Service. (2009). Total cash receipts by state, 1949-2007. Retrieved June 2009 from http://www.ers.usda.gov/Data/farmincome/FinfidmuXls.htm. United States Department of Agriculture, Food and Nutrition Service. (2007a). Commodity processing. Food Distribution fact sheet. Retrieved September 2009 from http://www.fns.usda.gov/fdd/processing/pfs-processing.pdf. United States Department of Agriculture, Food and Nutrition Service. (2007b). School Nutrition Dietary Assessment Study-III. Alexandria, VA.
United States Department of Agriculture, Food and Nutrition Service. (2008). White paper: USDA commodities in the National School Lunch Program. Washington D.C.
United States Department of Agriculture, Food and Nutrition Service. (2009). National School Lunch Program fact sheet. Retrieved February 2009 from http://www.fns.usda.gov/cnd/lunch/aboutlunch/NSLPFactSheet.pdf. Cora Peterson (c.peterson1@lse.ac.uk) is a graduate student in the Department of Social Policy at the London School of Economics and Political Science.